It’s been a busy few weeks. I was invited to preach at a Mass in St. Aidan’s in Brookfield on 4th May by Fr. Hugh Kavanagh continuing on from Christian Unity week in January. On 6th May the launch of Tallafest took place, check out the web site for more information www.tallafest.com. The event takes place over the weekend of the 6th and 7th July. It should be great fun and a good community event. On 18th May I took a service at the home of Grace, one of our Sunday school teachers, for the loss of her brother Gavin, in Kenya. On 19th May I went along to the May Fest in the Carmelite Convert in Firhouse, they were also blessed with beautiful weather. That evening I attended the Massey Concert for the Community Care Foundation which was delightful and was held in The Priory. On 21st in my capacity as part time chaplain to the ITT College I was invited to the Clubs and Society’s awards night in the Louis Fitzgerald Hotel. 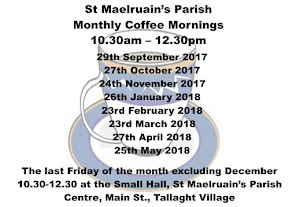 On 22nd I started a series of five tours of the Church and grounds for the senior classes of St. Maelruain’s School, Old Bawn. On 24th I attended the graduation in St. MacDara’s Community School for the sixth year students, it’s unfortunate that this event generally clashes with the setting up of the hall for the Summer Sale. Our former curate Obinna Ulogwara’s father passed away recently in Nigeria and Obinna wrote a lovely piece in the May Church Review on his dad and the customs of arranging a funeral in Nigeria. We express our condolences to Obinna and his family on the loss of his Dad, Emmanuel. As this is the last Newsletter before September I would like to wish the organisers of the Flower Festival the very best of luck with their plans for this event and to thank them for all the effort they are putting into its organisation. Please come to the Festival and spread the word among your family and friends and volunteer to help over the weekend of 27th – 29th September. It promises to be a fabulous showcase. The best of luck to those sitting state exams in June, it’s a stressful time for students and parents alike. May I take this opportunity to wish the readers of the Newsletter a very happy and safe summer. On 2nd May the blessing of the marriage of Niamh Agnew and David Beegan took place in Woodenbridge, we wish them both every future happiness. 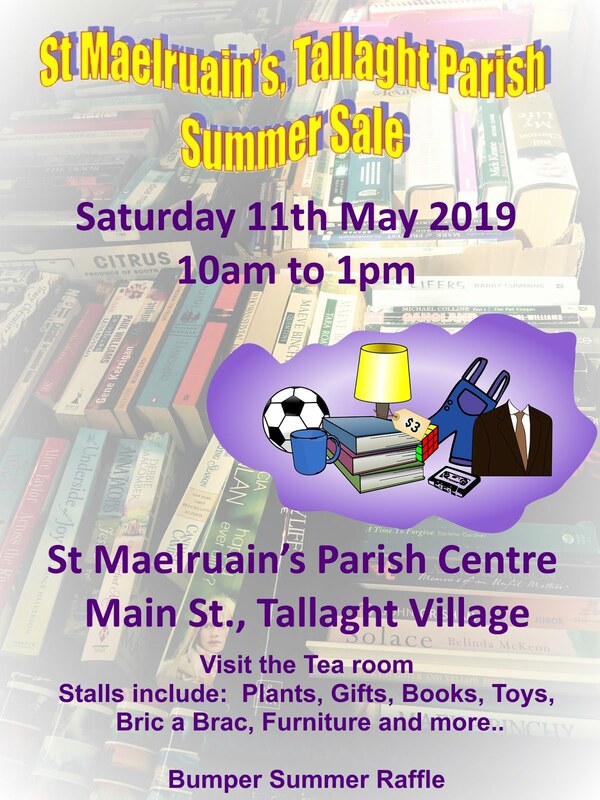 Raffle €1217, Furniture €766.20, Books and DVDs 507.89, Gifts, cakes and groceries €306.51, Entrance €316, Bottle stall €238, Bric a Brac €151.93, Plants €110, Jewellery €80.35, Teas €304.11, Toys €156.26, Sweets and Popcorn €45.35, Indian cuisine €138, Subs €40 with the grand total coming to €4377.60. Thank you once again to everyone involved. The committee are working hard on plans for the flower festival and have been fund raising in the Tallaght area and beyond towards the cost of the festival. Donations of any size will be greatly appreciated and can be given to the church wardens in an envelope marked Flower Festival. Many of the organisations and parishioners have already donated and we are extremely grateful to them. Thank you all! We are hoping all the parish will help make this event a great success by volunteering in any way they can to help over the week end of 27th, 28th and 29th September. We need lots of helpers for different jobs and are hoping that people might offer to do a shift of one morning or one afternoon over the week end. We will need ladies to help in the small hall with the teas and coffees on the same basis and people to provide tray bakes and scones of which we are going to need a lot!!! We need people to pick up litter, to wash up, to direct visitors, to meet and greet and chat to visitors along the way, to help with the car parking, to direct cars...simply to be there to help out in whatever way they can. If you are willing to help, remember just one shift will help us so much, please put your name on the list in the porch for stewarding or catering. If you would like more information for stewarding and general helpers, contact John at 0861026380 /4522930 and for catering call Liz 0872441684. We want this event to put our parish on the map and to showcase all we do in the parish and the surrounding area. A percentage of the profits from the event will be donated to the Tallaght Homecare Hospice Team. Many thanks...The Flower Festival Committee. On Saturday 18th May we travelled to Lismore Castle & Gardens. As usual we were joined by Clondalkin members and ICA members – 34 of us in all. We stopped for delicious scones and coffee in the Dolmen Hotel Carlow, and following a quick stroll in their riverside garden headed on to Lismore passing lovely pastoral countryside on the way. Lismore Castle and Gardens laid on more scones with cream and home made jam and most of us sat in the garden enjoying the blossoms and magnificent surroundings and the view of the town. Most of us took the opportunity to visit Lismore Cathedral and Heritage Centre where there was an excellent audio visual presentation of the history of Lismore narrated by Niall Tobin. Mid afternoon our coach travelled to Clonmel passing by woodland full of bluebells and mountain panoramic scenery through the Vee.Pass. Unfortunately for the shoppers our time in Clonmel was limited! Following our four course dinner in the Dolmen in Carlow, we sang our way back home ! Thank you to Valerie for arranging the outing with Marathon Travel. A very happy day to treasure with members and friends. On Thursday 6th June members from branch Down &DromoreBranch are travelling down to partake in the 1115am Holy Communion Service in Christ Church. Enjoy the summer break….and we will as usual announce our 2013 -2014 programme in September. We would like to set up a parish email register to contact parishioners regarding the Newsletter, announcement sheets and any other additional events. 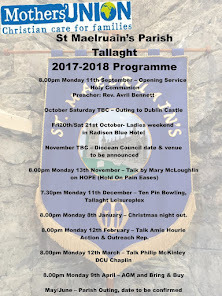 There will be a list to sign in Church or email the parish office at tallaghtparish@gmail.com with your email address. The Bible Study group have moved their meeting time from Wednesday evenings to Wednesday mornings at 11am. On the first Wednesday of the month the bible study will follow the Holy Communion Service at 12pm. WHIST DRIVE The next Whist Drive will take place on Mon 24th June at 8.00pm in the Small Hall, all welcome! The Whist Drives will continue to run over the summer months on Monday 15th July and on Monday 19th August at 8.00pm. 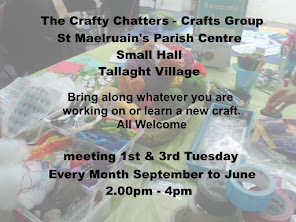 The Crafty Chatters will meet on 4th June at 2.00pm. Please bring along whatever craft you are working on. 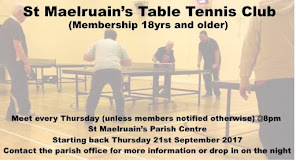 In July and August we will be meeting each Thursday evening at 8.00pm. All welcome! The PTA are having a Midsummer Concert with classical, traditional and contemporary music in the Church with an ensemble from Kylemore School of music, school pupils, parents and friends taking part on Friday 21st June to raise funds for the Parish School. Tickets €5.00 available at the door. The Diocesan summer camp will take place from Sun 30th June to Fri 5th July. The camp is aimed at children from 4th – 6th class primary school. It will take place in St. Columba’s College and there will be all sorts of fun activities for the kids including, multi sports, arts and crafts, swimming, disco etc. Contact Amy Deverell, one of the camp leaders for booking form and more information. Don’t forget to remember your Dad on Father’s Day, Sunday 16th June!